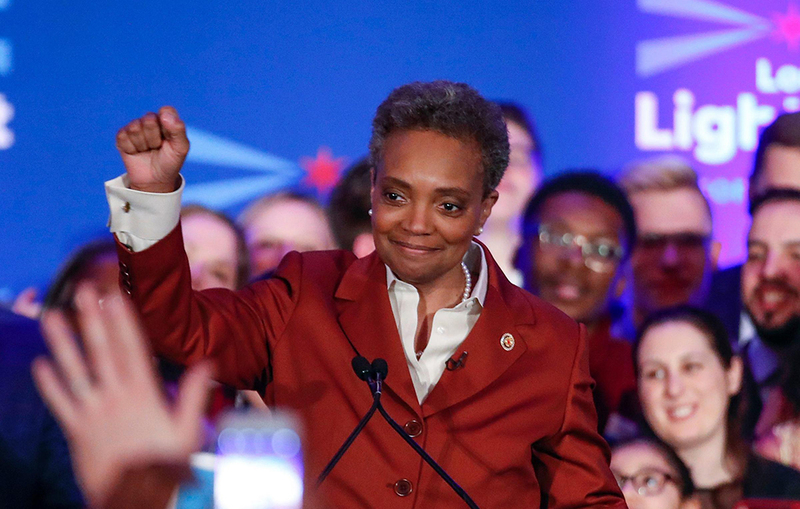 Lori Lightfoot swept into office as mayor of Chicago Tuesday, promising to change the way the city does business, focusing more on neighborhood investment and small companies than previous administrations. But after eight years of Mayor Rahm Emanuel’s aggressively pro-business agenda that included a soaring skyline, a growing tech sector and high-profile corporate relocations, Chicago’s business community had a decidedly mixed reaction to Lightfoot’s victory. A former federal prosecutor and political novice, Lightfoot handily won a runoff against Cook County Board President Toni Preckwinkle, becoming the first African-American woman and openly gay candidate elected mayor of Chicago. Her grassroots campaign was built on a platform of change and reform, a message that resonated with voters weary of the so-called Chicago way. Her economic plan reflected the same themes, essentially characterizing Emanuel’s policies as a “false choice” between investing in the downtown business district or in Chicago’s neighborhoods. She pledged to continue the development downtown, but work “even harder” to bring investment to struggling neighborhoods on the west and south sides by fostering small business growth. But business leaders including Tullman questioned whether the city can afford to take its foot off the accelerator when it comes to recruiting major companies and encouraging development downtown. Tullman said that if Lightfoot is any less aggressive than Emanuel has been at wooing tech companies to Chicago, Atlanta and other cities will be waiting in the wings to scoop them up. Lightfoot, though, said that the gains can be more widely shared throughout the city. Last month, she spoke at the startup hub TechNexus in the Loop about the importance of getting resources to entrepreneurs wherever they are in the city. “We need to create incubators for businesses in our neighborhoods so we can add this kind of vibrancy, peer to peer contact, mentorship, all the good things that come from incubators, we have got to do them out in the neighborhoods, particularly south of Roosevelt and west of Ashland,” she said. Lightfoot also discussed getting rid of the aldermanic prerogative that has made entrepreneurs feel as if they must “kiss the ring of some alderman to do anything” in the city. She said that system has stifled growth and innovation, and discouraged people from staying in Chicago to do business. Chicago’s diverse economy has helped it through “a lot of ups and downs” in the past, Lightfoot said. But it’s critical to understand where the economy is going and create a pipeline of talent to fuel it. Lightfoot’s office did not respond to a request for comment on Wednesday. When Emanuel was elected for his first term as mayor in February 2011, the former congressman and White House chief of staff under President Obama was a savvy political veteran with deep ties to Chicago’s business community. Throughout his tenure as mayor, he promoted the city and his recruitment efforts tirelessly, convincing big name businesses like McDonald’s and Conagra to relocate their headquarters to Chicago, while missing on Amazon. High-profile events such as the NFL Draft showcased the city on a national stage, while Choose Chicago, Emanuel’s revamped tourism bureau, helped push annual visitors past the 57 million mark last year. But beyond the gleaming downtown was a economic dichotomy, where violence and poverty persisted in neighborhoods on the south and west sides. “The economic impact has and continues to be devastating,” Lightfoot said in her economic plan. That plan, which was published online, focuses on small business growth in Chicago neighborhoods by streamlining access to capital, eliminating red tape, decentralizing city agencies and other mechanisms designed to encourage development in distressed communities. Allen Sanderson, a University of Chicago economics professor who criticized the city for giving away too much to lure the NFL Draft, expressed some reservations over Lightfoot’s focus on small business development. Sanderson said big businesses tend to be more efficient than small businesses, which improves the likelihood of success, job creation and retention. While Sanderson acknowledged the inequality of income across Chicago’s neighborhoods, he questioned whether allocating resources from the city center to encourage peripheral development is the answer. Juliana Kerr, director of the global cities program for the Chicago Council on Global Affairs, said the groundwork laid by Lightfoot’s predecessors will enable her to focus more on neighborhood development. “She now has an opportunity to be able to focus on the neighborhoods because the Riverwalk has been rebuilt, because of Millennium Park, because of all those great initiatives that have helped make the downtown core a thriving ecosystem for the city at large,” Kerr said. Jack Lavin, president and CEO of the Chicagoland Chamber of Commerce, believes Lightfoot will find the right balance between downtown and neighborhood development, and supports her emphasis on small business. The Chamber of Commerce joined a long list of civic institutions that endorsed Lightfoot over Preckwinkle during the runoff election. Nowhere is the pro-business environment under Emanuel more evident than the skyscrapers and large-scale developments that have sprouted up in downtown Chicago and its environs during his eight years in office. Most recently, Emanuel helped win zoning approval for Sterling Bay’s massive $6 billion Lincoln Yards development planned for the North Side. Chicago developer Related Midwest also has a number of ambitious projects in the pipeline, most notably The 78 – a planned residential, retail and commercial development on a vacant South Loop site. A proposed centerpiece is the Discovery Partners Institute, a public-private technology research center envisioned as a way to train and retain top talent by encouraging businesses to locate nearby. Bailey said that while downtown development “may change course a little bit” under the new administration, he is confident growth will continue. If development moves out to the neighborhoods, Related Midwest would be ready to take part. The 78 was also one of about 10 Chicago sites offered up as a potential home for Amazon’s second headquarters. In November, Amazon announced it would split its second headquarters between New York’s Long Island City and Arlington in northern Virginia, bypassing Chicago’s bid. New York offered Amazon $3 billion in tax and other incentives, enthusiastically backed by Mayor Bill de Blasio, who, like Lightfoot, succeeded a pro-business mayor in 2014 on a progressive platform focused on alleviating economic inequality and developing affordable housing. In February, Amazon pulled the plug on its proposed New York headquarters amid local political backlash over the incentive package. Tullman, who is now executive director of the Ed Kaplan Family Institute for Innovation and Tech Entrepreneurship at the Illinois Institute of Technology, said the shifting political winds in New York are a cautionary tale for Chicago.